Welcome to this section of my homepage, which is dedicated to my hobby Amateur Radio, also called Ham Radio. 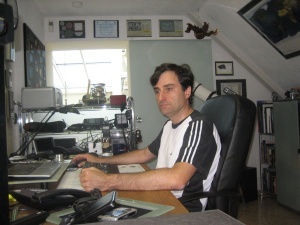 On the upper right picture you can see me sitting in one of my "Radio Shacks". "Shack", that's how we radio amateurs call our room with the radio equipment such as transceivers for various operations modes like ATV, FAX, SSTV, FM, SSB, satellite communication and Packet Radio. Radio amateurs have the privilege to build and operate their equipment (e.g. receivers, transmitters, amplifiers and antennas) on their own. To test these devices I have acquired and built over time quite some test equipment. We have multiple homes and thus I happen to have several Radio Shacks and respective antenna setups. The home shown on the picture to the right is located in the area of Heilbronn. It is an old house with a barn and you can see my shack and some of my equipment on the respective page when you click on the picture. We also a home in the area of Freiburg/Breisgau.. You can find some more information about this station when clicking on the picture to the left. The page is not yet complete and I will post a more detailed description of the ham radio station once it is fully set up. I also use a little portable station when I am in our summerhouse. I am mostly using this little station on VHF/UHF but occasionally also operate on the upper HF bands (10m, 15m and 20m). Please click on the picture to the right to get to this page showing the setup and examples of operation logs. I am travelling quite a bit by car and enjoy staying in touch with friends using my Kenwood TM-D710E dual-band (2m, 70cm) mobile transceiver which also supports APRS. I also use some handheld transceivers especially when going for a walk. Please click on the picture to the right to get to the respective page for portable operations. I used to work mostly on VHF / UHF / SHF frequencies but since 2003 also operate sometimes on the HF bands. If you click on the picture to the left you get detailed frequency allocation and amateur radio band plan information. Propagation conditions are different on the various frequency bands and vary over time. They are a function of a number of parameters including the status of the ionosphere. 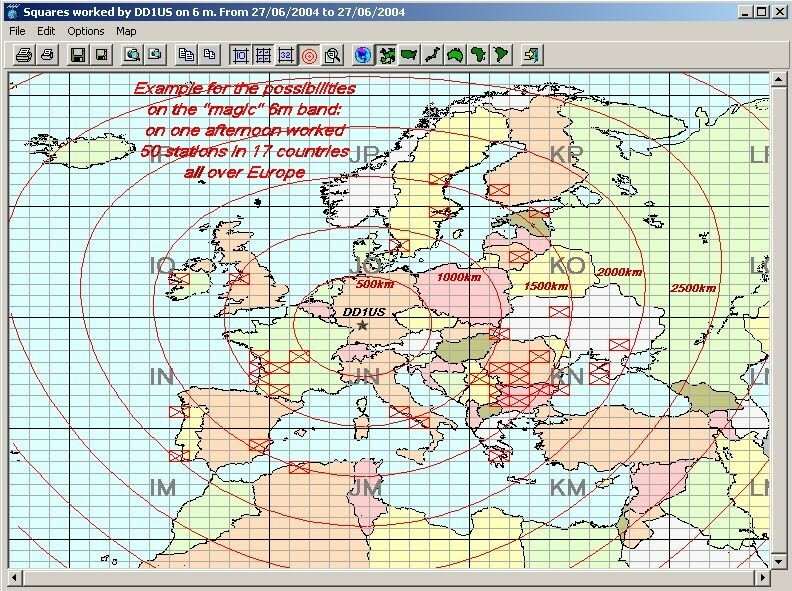 The link on the left shows a map with the Maximum Usable Frequencies (MUFs) for 3000 kilometer radio signal paths. The map also shows the present grayline and other important features for long distance contacts (DX). Especially on HF but also on VHF and sometimes on UHF the magnetic field of the earth has a strong impact on the propagation of the respective waves. One of the associated phenomena are reflections at Aurora zones which can influence the propagation of radio waves and provide DX conditions. On the right please find a link to present magnetometer data and predictions of the Aurora probability in Germany. The further the cursor is moving to the lower right corner the higher the likelihood for an Aurora. If you want to know which DX stations are presently active you can click on the icon on the left. The DX-Cluster is an internet platform where stations on the various bands are logged. You can thus find out which country on which band can be presently reached. In order to improve the operator's skills and also to get more people active on the bands there are many "contests" organized by the various amateur radio organizations around the world. Clicking on the icon to the right you will get to the excellent contest calender of WA7BNM which provides a perfect overview o the various contests and the associated rules. Amateur Television (ATV) was one of the operating modes I like most. I used to build most of my equipment myself. Shown in the photograph below is my home-brew FM-ATV dual band transmitter (for the 1.2 and 2.4 GHz bands). Sometimes I am also using repeaters. Repeaters are typically placed on hills or other elevated sites. They are receiving a signal and retransmit it. They help to extend the range between stations and thus stations which cannot hear each other directly can make contact. You can find tables of repeaters in range of my homes on the respective pages. Repeaters support not only analog (FM) voice communication but some of them are supporting also digital (DStar, DMR) voice transmissions. An increasing number of repeaters can be linked together and thus the range of operation can be further increased. The Ham Radio community operates a backbone network in the 5.6-5.8 GHz range called HamNet. Click on the little map to the right to get more information. Many people think, that Radio Amateurs use only short wave (HF) frequencies. I guess this is based on the historical use of Amateur Radio as a low cost medium to talk to friends all over the world as well as an efficient wireless system for emergency cases. Not very long time ago private world-wide communication based on long distance phone calls was quite expensive. Today people can use a simple Internet connection to talk to friends all over the world almost free of charge. However I think that it is still fascinating to use the HF bands with their specific propagation characteristics. I am not very active on the shortwave bands but if you are interested I will be happy to arrange a sked. If you do not have access to a shortwave receiver or suitable antenna you can also use receivers which are made available via the Internet. For example the University of Twente together with the Dutch Amateur Radio Club VERON has setup a software defined radio and appropriate antenna in Enschede and makes it publicly available. It is developed and managed by PA3FWM. This multi-mode receiver covers 8 bands from 65 kHz up to 21.5 MHz and can be operated by multiple users simultaneously. You only need an Internet-PC with a soundcard running a web-browser supporting Java . Click on the picture to the left to get to the respective page and give it a try. Software defined radio has become a very interesting technology and is meanwhile also affordable for most radio amateurs. I have various different SDRs not only for HF reception but also up to SHF. Some of them I use as a spectrum scope and demodulator connected to the 10.7 MHz IF output of my wideband receiver. In the "Sounds from Space" section of this homepage you can find many audio recordings complemented by spectrum and waterfall diagrams generated using SDRs. When using the 4 element Yagi (actually it is an extended HB9CV antenna) on 50 MHz very nice contacts are possible. 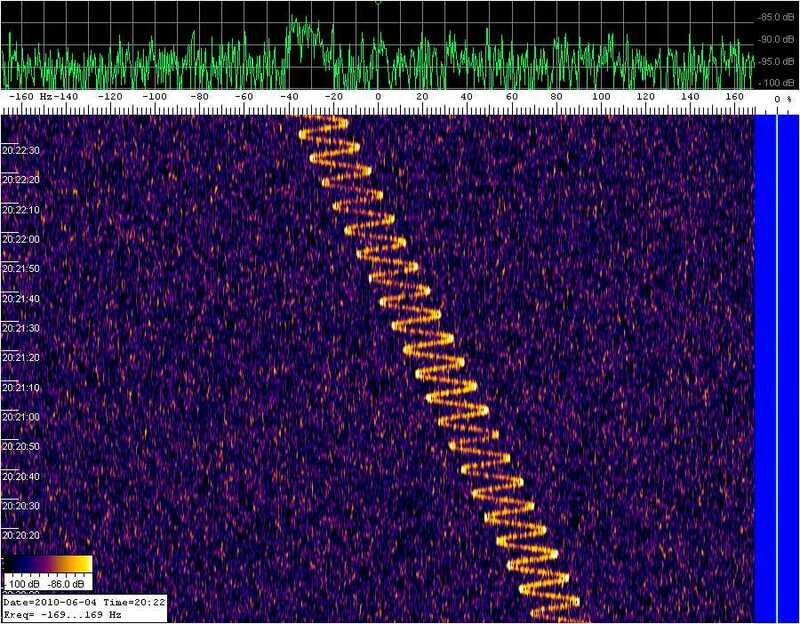 The 6m band is sometimes called the "magic band" because all of a sudden very strong signals from stations far away come up and disappear just as fast shortly later. Clicking on the little map on the right you can see a larger map, which will show you an example how many contacts and countries can be worked during one afternoon with reasonable good conditions on 6m (example data are from June 27th 2004). Actually my contact bridging the longest distance (>6000km) during that day is not shown, because it was outside of Europe: it was a contact (QSO) with W1FC located at the East coast of the USA. One of my homes is based in a small village in a valley, which is surrounded by hills in most directions. You can see more details of the terrain if you click on the 3D picture to the left (north is up). Unfortunately those hills block my transmissions at low elevation angles and thus I am handicapped with respect to terrestrial communication at very high frequencies (UHF and SHF). This is one of the reasons why I became very fond of satellite operation using the various OSCAR (orbiting satellite carrying amateur radio) and RS (russian satellites) satellites. 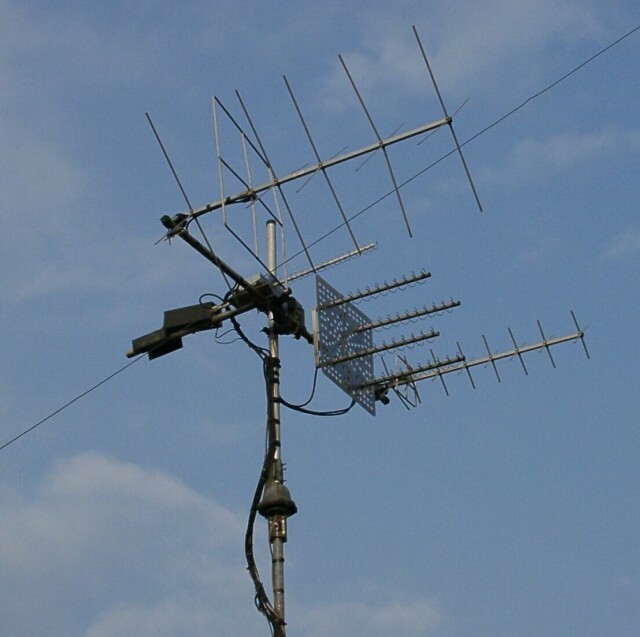 These satellites which are built by radio amateurs around the world support multiple operating modes such as voice (SSB, FM), morse code (CW), data transmissions (packet radio), still pictures (FAX) and slow scan television pictures (SSTV). Satellite communication is challenging because many parameters of the ground station have to be controlled carefully and simultaneously. 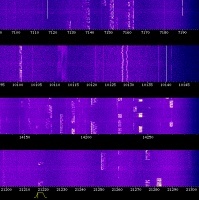 The signals of the low earth orbiting satellites (LEOs) can be very strong, such that communication even by a hand held portable transceiver using an omni-directional antenna is possible. However some of the satellites have a highly elliptical orbit and in apogee the satellite is approximately 40000 km away and thus the signals can be also very weak. 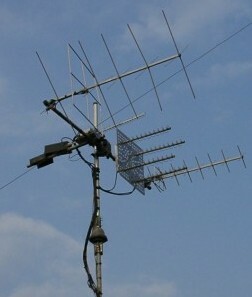 Therefore directional antennas and low noise receivers have to be used. For me it is one of the rewarding areas to build and optimize the ground station. On the right picture please see my antenna system which I used to have for satellite operation. It is presently taken down for renovation of the room but planned to be put up again in the near future. On this photography you see (from left to right) a 2m X-Quad antenna, a 13cm helical antenna, a 23cm helical antenna array and a 70cm X-Quad antenna. The antenna system can be rotated both, in azimuth and elevation, manually or fully automated by a satellite tracking program running on a Windows PC. To be able to appraise the receive system sensitivity of a satellite ground station, regularly test signals with well defined power levels (in memoriam to K2ZRO called ZRO tests) used to be transmitted by the control stations. The first ZRO test was conducted via AO-10 on May 5th 1985 at 11:30 UTC in Mode B (145.850 MHz downlink). During these tests Morse code was transmitted via the satellite transponder and the uplink signal of was attenuated precisely in 3 dB steps until the signal was very weak (level 9 means 27dB below the regular level of the satellites beacon). I spent some time to optimize my station and was finally able to receive down to level 8 using rather small antennas (the 2m and 70cm X-Quad antennas you can see on the picture above). On AO-10 and AO-13 ZRO transmisions were conducted both, 2m (145 MHz) and 70cm (435 MHz) band. If you would like to listen to such a ZRO transmission you can click on the picture to the right. This image is a visualization of the audio signal with frequency increasing from left-to-right and time bottom-to-top. 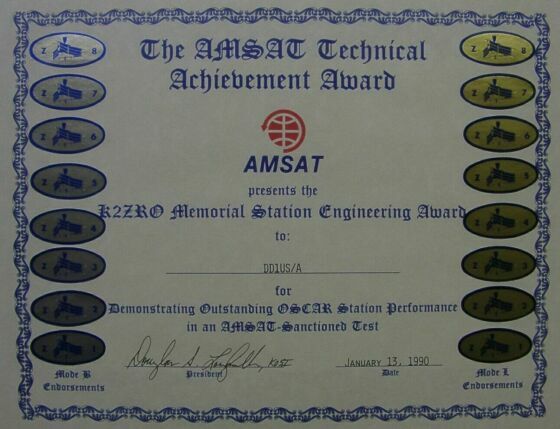 You will hear the ZRO transmission from Andy McAllister conducted on 2m band on April 24th 1993. The sound track is 6 minutes long and contains continuous data, starting with ZRO level 8 (CW signal 24dB below the beacon) including level 9 (-27dB) and level A (-30dB) signal, finishing with the "End of Test" message at full power. Many thanks to Darrel AA7FV for this record. Another aspect of the ham radio hobby can be to try to reach as many stations in other countries or continents as possible. One can apply for various diplomas confirming the achievement of certain criteria. Furthermore there are regular competitions called contests, when individual ham radio operators or whole groups try to make as many contracts to stations as far away as possible in a given time. While I am not very fond of diplomas and contests I applied for one which is shown on the left. 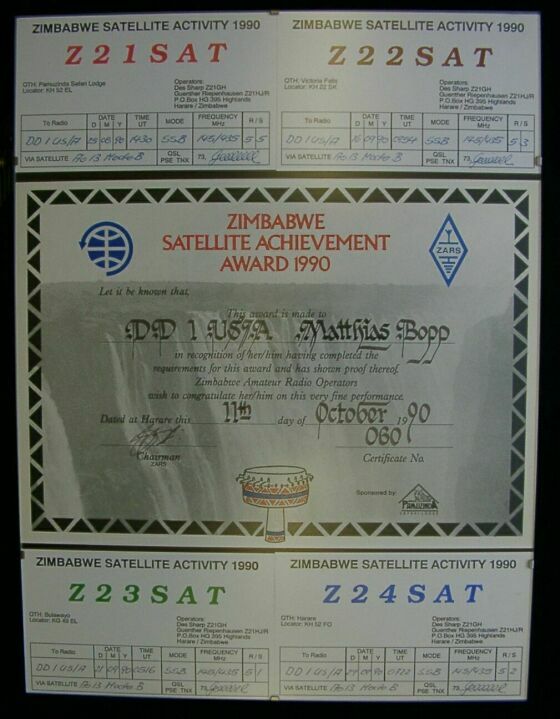 A friend in Zimbabwe arranged it while travelling to different locations and operating via AMSAT OSCAR 13. The present location and status of all Amateur radio satellites can be found on the Homepage of AMSAT Argentina. Please click on the picture on the right to see this excellent summary in English language. A table with a summary of recent satellite reception records is provided by AMSAT NA. Please click on the icon on the left to access this page. If you receive satellites yourself please also submit your report on this page, thanks ! N2YO provides a web based satellite tracking tool which calculates the present locations of various satellites and includes a nice graphical display. If you click on the picture on the right you can access his program online and get real time data based on always up-to-date Keplerian elements. Sometime I also operate an APRS satellite internet gateway. My gateway feeds digital signals, which are received on VHF (145.825 MHz) from various satellites (including NO-44, NO-60, NO-61 and also from the ARISS experiment on the international space-station ISS) live to the internet. This enables the control stations and other interested people to monitor the traffic and the telemetry of the satellites while they have no direct access to the satellites as they are above other parts of the globe. The more gateways are operated, the better the coverage. You can access the worldwide collected data by clicking on the picture to the left. It is also possible to use the uplink of the satellites to communicate online with other Ham Radio operators. The various AMSAT groups worldwide are continuously looking for support for their next generation programs. This can be actual support in building satellites or components or a financial support of the projects. 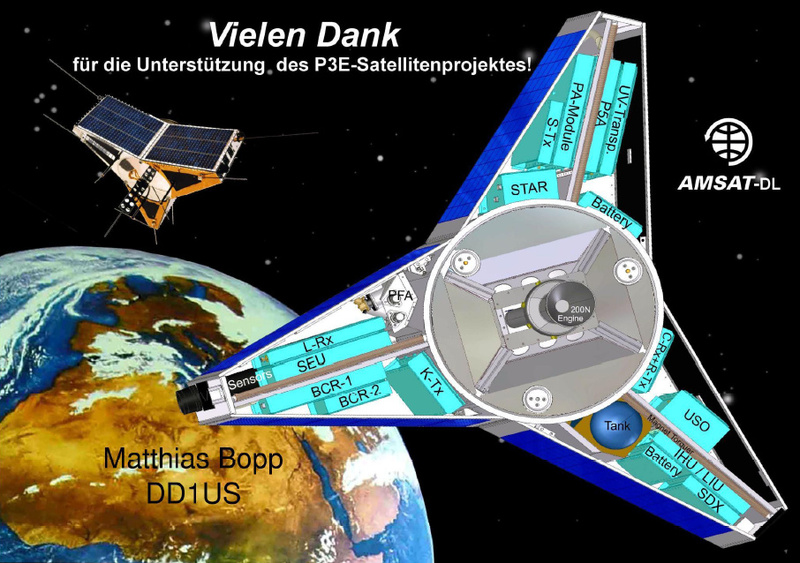 One of the next major projects which is presently in preparation by AMSAT in Germany is P3Express. As this will be a satellite in a highly elliptical orbit it will allow the users worldwide contacts. AMSAT needs also your support and if you would like to donate to this program please visit the dedicated website www.p3e-satellite.org. You will receive a nice gift card like the one shown on the right. I had various contacts to the cosmonauts and astronauts in the space stations MIR, the US Space Shuttles and the International Space Station ISS. Below please find some examples. An extensive collection with historical sound tracks related to Satellites, Space Ships and Space Stations is available in the "Sounds from Space" section of this website. Following a contact (QSO), ham radio amateurs exchange (QSL) cards for the confirmation. On the left you can see such a card which I received from the space station MIR. On the right you can see my own QSL card. During the "Euromir 94" mission in October 1994 Dr. Ulf Merbold, DB1KM, stayed 4 weeks onboard the space station MIR. I had the chance to talk to him on 2m. He used the callsign DP3MIR. You can listen to part of our contact if you click on the button at the left. During the "Euromir 95" mission Dr. Thomas Reiter, DF4TR, stayed 6 months onboard the space station MIR. During this time he was also active in Amateur Radio using the callsign DP0MIR. I had 4 voice contacts with Thomas using FM simplex mode in the 2m band (frequency 145,975MHz). The first audio file was recorded on October 4th 1995 around 6 am UTC. The second file was recorded during another contact some days later. In 1997 the SAFEX Ham Radio equipment onboard the MIR space station was configured as a 70cm voice repeater. You can listen to a contact I had with Torsten DG7RO operating at the club station DL0TZ if you click on the button at the left. Starting December 12th 1998 an Amateur Radio SSTV transmitter was activated in the Russian Space Station MIR. Here is an article describing how this came into existence. If you like, you may have a look at some pictures I received directly from the MIR space station in December 1998. The transmission was Slow Scan Television (SSTV, sub mode Robot). 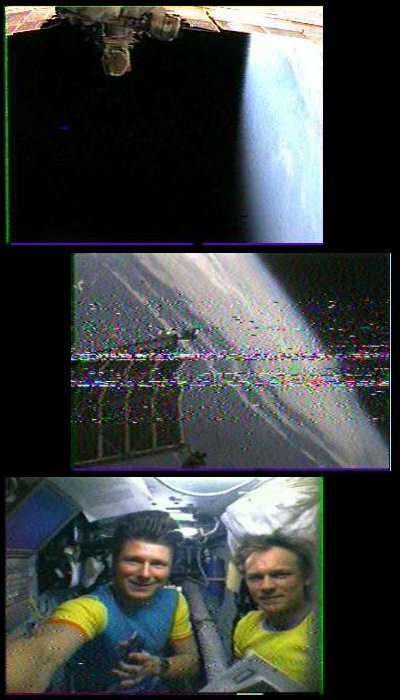 During the first two pictures the camera was directed out of the window showing part of the space station. The 3rd picture shows the crew operating the HAM radio equipment. The International Space Station (ISS) does also have ham radio equipment onboard. In October 2002 I had my first voice contact with Expedition 5 mission commander Valery G. Korzun. 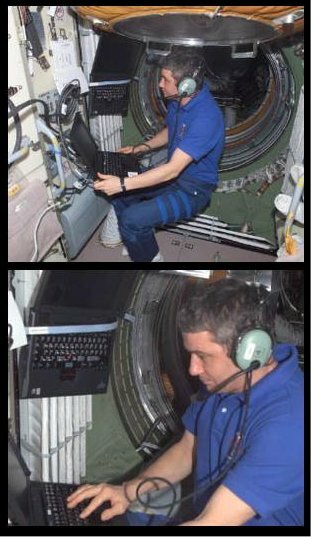 On the right you see Valery using the amateur radio equipment in the functional cargo block (FCB) of the ISS. You can find many more reports and recordings of MIR and ISS contacts in the Sounds from Space section of this website. Since March 2014 there is also a DATV (Digital Amateur Television) transmitter in the European Columbus module available. The transmitter is normally only transmitting a black video signal unless a camera is attached (mostly for school contacts). The DATV transmission is on 2395 MHz in DVB-S2 at 2 Msps. Parameters used are SR=2000, FEC=1/2, PIDVideo=256, PIDAudio=257, MPEG2. Since January 2018 I am part of the ground station network which receives the signal and streams it via the internet to a central server in UK where it is combined and made available for all interested people (see the link to the right). If you are interested, where the international space station ISS is presently located and whether you may be able to listen to its transmissions or watch it in the twilight, the picture to the right shows you its current location. 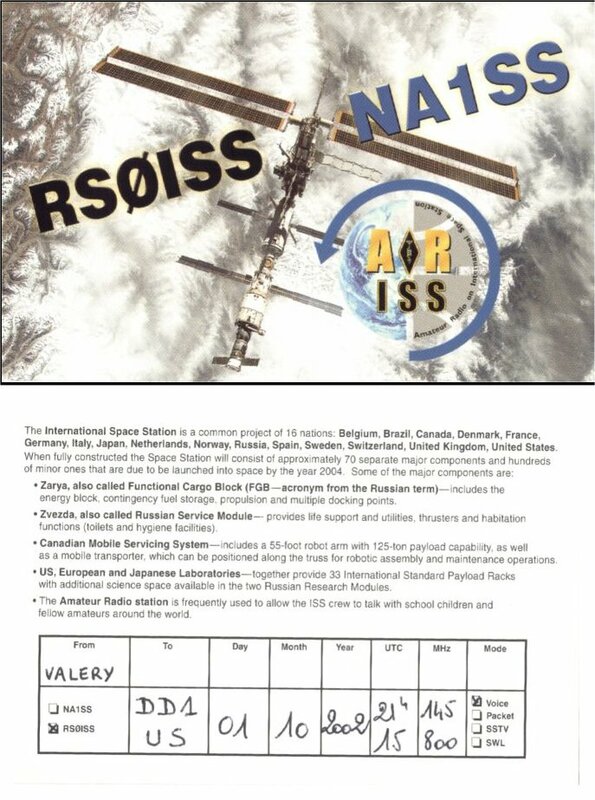 If ISS is active in Ham radio while over Europe the normal frequencies to be used are 145.825 MHz for Packet Radio / APRS (up and downlink) or 145.800 MHz (with 145.200 MHz for the uplink) for voice contacts. Please remember that there will be some Doppler shift of up to +/- 5Khz while ISS passes over you. You will have to tune your receiver to a higher frequency while ISS approaches you and to a lower frequency when it moves away. In reverse you will have to tune your transmitter for the uplink. In addition the link below will get you to a simulated real time view of the Earth, as if watched through the round window of the US Destiny Lab on ISS. Please note that quite often you will only see the blue ocean as Earth is mostly covered by water. You probably already noticed based on the descriptions above that I am very interested in Space Communications overall. Therefore I decided to add a section with historical sound tracks related to Satellites, Space Ships and Space Stations. I hope you will enjoy browsing it. Please click on the picture on the left to access these pages which I named "Sounds from Space". Another very interesting mode is Faxsimile (FAX). Here, besides ham radio operation, also the reception of polar orbiting weather satellites (LEOs) is possible. I built the necessary FM receiver (shown on the left side). 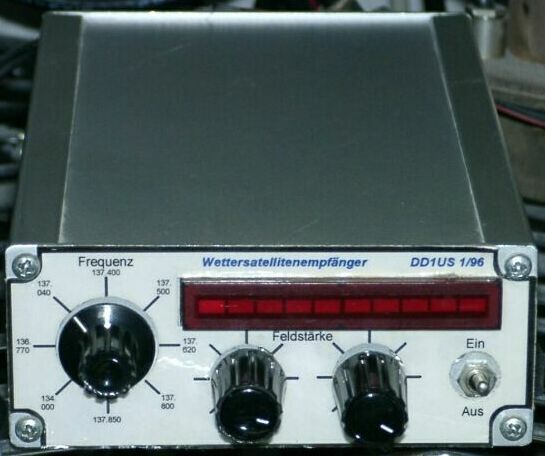 With this receiver and my 2m X-Quad antenna I did receive the automatic picture transmissions (APT) of the NOAA and Meteor weather satellites at 137 MHz and decoded it with the sound card of my PC. The complete station was running fully automated and is controlled by a PC. Presently the X-Quad antennas are down and I am using omni-directional antennas like turnstiles and QFHs. Receivers include the R2FX from Holger Eckardt DF2FQ, the Vierling Weatherman, the wide-band receiver ICOM PCR-100 and the Airspy SDR. You can find the latest status about which WX-Sats are active and the respective frequencies when clicking on the icon on the right. If you click on the icons below you can see some of the weather satellite APT pictures which I received. Behind most of the icons you will actually find a collection of pictures. If you want to know how such an APT transmission from a Meteor or a NOAA satellite sounds, please click on the receiver icons below. You can also learn more about such transmissions on my page "Sounds from Space". In January 2015 I started to receive also LRPT (low rate picture transmissions) from Meteor M-N2 who was launched in July 2014. This satellites transmits also in the VHF band but uses digital modulation (QPSK). I am using the same QFH antenna as I use it for APT picture reception but an AOR AR-5000 wideband receiver with an SDR (software defined receiver) attached to the 10.7 MHz output of the AR-5000. In October 2017 I started to receive also the HRPT weather pictures of various satellites including NOAA-15, NOAA-18, NOAA-19, Meteor M-N2, METOP-A, METOP-B, Fengyun 3A, Fengyun 3B and FENGYUN 3C. I am using a 2.3m fine-mesh dish with automated tracking. The receiver is an Airspy-Mini SDR. I am using WXTrack for providing the tracking data of the satellites by DDE, PSTRotator using the DDE-data to control the rotator and XHRPT to demodulate the signal. The I/Q data from the Airspy-Mini is streamed via IP to XHRPT by SpyServer which is running on an OdroidXU4 board.